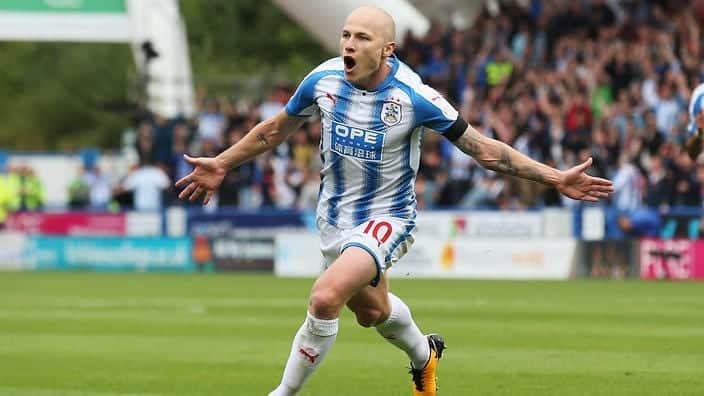 Aaron Mooy’s outstanding performance over Wolverhampton Wanderers was instrumental in propelling Huddersfield Town to victory over Nuno Espirito Santo’s brilliant Wolverhampton Wanderers outfit. 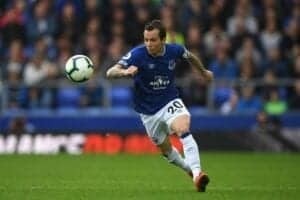 In a match where the Australian bagged a double and also scored his first goal since December 2017, the triumph crucially elevated the Terriers out of the relegation zone and off the bottom of the table. Operating in his right sided central midfield position, the 28-year-old’s contribution on both sides of the ball was of an exemplary standard. An ever willing worker on the defensive end, he harassed, pressed and imposed himself physically on his opposition. Responding sharply to pressing triggers and angling his pressing nicely to block off passing routes back infield to hem in his targets, his impact here was felt keenly. His backwards pressing deserved special mention, for his relentless work rate meant he often caught the ball holder off guard to nip in from behind and win back possession. Coming from their blindside and outside their field of view, the example below illustrates how he effectively chimed in to generate some promising scenarios for his team. Full of bite and aggression, he applied his interventions forcefully, but also with thought, as he marshalled his designated area of operation with authority. Choosing astutely when to press the ball near central midfielder or nearby centre-back, Willy Boly, his positioning ensured he had access to press or block pass lanes to both men. Mooy impressively transferred his superb output into his attacking exhibits too, where his output was littered with upside. Passing the ball cleanly and with accuracy, he orchestrated many incisive offensive passages. 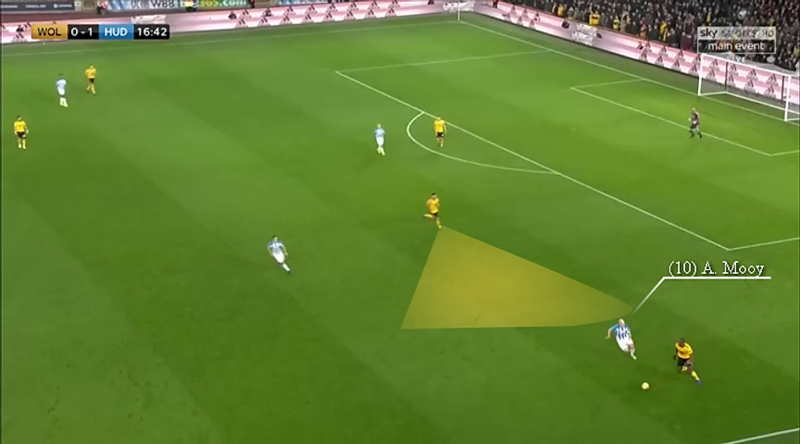 He moved the opposing structure with some pinpoint diagonal deliveries, that importantly shifted Wolves’ block to press from two sides, which subsequently opened up two potential pass lanes. In addition, his raking switches of play to isolate his wide men, intricate combination play in confined zones and patience to recycle possession calmly offered further benefit. Two footed and calculated, the weighting, execution and confidence in his passing were key for the away team. So smart with his positioning and anticipation, the Socceroos star’s movement enabled him to cause major concerns for Wolves. Forever scanning where his colleagues, his opposition and where the vacant spaces were, this gave him a strong mental imagery of his surroundings. Then, armed with the aforementioned information, he duly exploited openings that arose within Wolves’ structure. 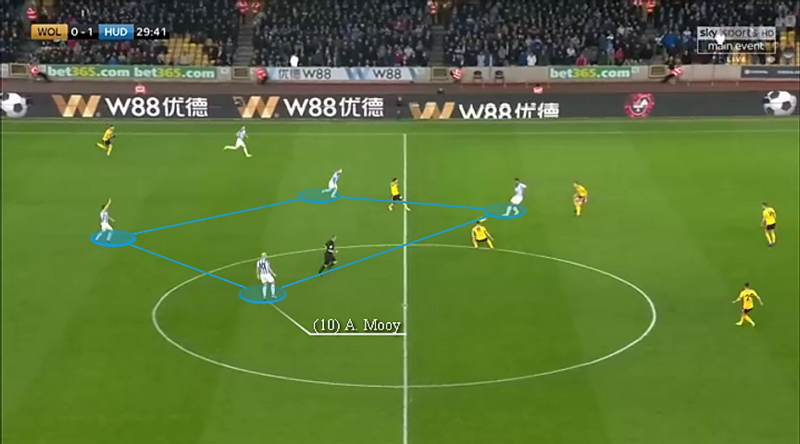 Alert to when Wolves’ midfield duo of Ruben Neves or Joao Moutinho would spring forward to press, Mooy would cleverly take advantage of the spaces behind them. He regularly found room to obtain possession here, as his attackers did a great job of pinning the opposing central defenders, which deterred them from stepping out to harry him. What’s more, his ability to anticipate and be ready to latch onto second balls, knock downs and flick ons from his forwards was vital too, thus allowing him to get on the ball in dangerous areas while initially evading his nearby adversaries. Furthermore, the timing of his movement and the way he dynamically occupied space served him brilliantly when he supported wide attacks and generated midfield overloads. Indeed, by helping his team gain numerical and positional superiorities, in combination with his distribution, this was key towards Huddersfield’s capacity to break down the home side. The set piece specialist’s magnificent finishing in his match winning double were the perfect accompaniments to his sterling body of work. Blending power, placement and masterful ball striking, his technique was on show for all to see, with these two strikes encapsulating his quality. By the numbers, his two dribbles, four shots, one key pass, five tackles, four interceptions, seven ball recoveries, two blocked shots and five fruitful pressing actions punctuated his sterling body of work accordingly. His manager couldn’t have summed up his midfield maestro any better on a night where his outstanding performance will live long in the memory of Huddersfield fans all over.